The writing ain’t all that great. Slash has written some of the most identifiable rock riffs of the last 30 years and serves as a guitar hero for a generation. His longtime collaborator Myles Kennedy is a soulful, blues-based vocalist cut from the same cloth as Glenn Hughes, David Coverdale and, later, Chris Cornell. 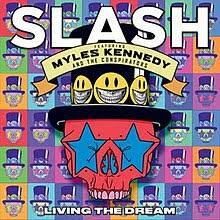 There’s no short supply of talent on this latest offering from Slash, Kennedy and their friends the Conspirators. Kennedy can belt out lyrics with feeling and Slash can bang out riffs and power chords, but the trouble with their new record, Living the Dream, is that the writing ain’t all that great. There are hooks, sure, and “The Call of the Wild” seems to be tailor-made for arena performances. The trouble is that the track, and the other pieces filling out this collection, never amount to much more than a series of random good ideas strung together. There really aren’t any well-crafted songs as such and, lyrically, there’s not much to which the listener can affix deeper meaning. Kennedy has proven himself as a capable writer with his solo work, including the recent Year of the Tiger, but he doesn’t display the same songwriting acumen here. Instead, he approaches his role as though he’s merely aiming to prompt listeners to join in and sing along, though we don’t know what we’re singing for. Great rock ‘n’ roll anthems have a reason: We’re uniting against an evil lover, an authority figure who tells us we’re crazy to follow our dreams or that body of people who tell us we can’t rock when we wanna rock. What are we united against here? It’s hard to say. The collective talents are wasted on Buckcherry knockoffs such as “Driving Rain” and “My Antidote.” Even Slash’s previous supergroup Velvet Revolver—burdened by batches of emotionally empty compositions—fared better than this. Some of that comes down to Slash; he’s undoubtedly one of the greats of his generation, and yet he’s rendered nearly inaudible at times against a wash of harmonized vocals and quantized drums. Is that guitar we hear or a computer’s idea of a guitar? Too often, it’s difficult to say. What would be better? This gang pumping out a down-and-dirty batch of rock songs without the trappings of modern technology? Without concern for getting on the radio and instead getting on with the business of being a great heavy rock act? Surely the involvement of a guiding hand by someone like writer/producer Desmond Child could’ve set this ship to right. But Slash and Kennedy appear content to merely coast along on their continued goodwill among the masses. It’s easy to love them and want to plunk down dollars to see them on the stage or listen to them on record. But it’s difficult to imagine that Living the Dream will endure as one of their memorable efforts.